On March 14, nearly 400 members of the George Eastman Circle attended the sixth annual George Eastman Circle New York City Dinner at The Plaza. During what has been a perennial celebration of remarkable growth and achievement, members commemorated another year of accomplishments while recognizing the impact made possible by their commitments. The generosity of members has put them at the forefront of the University efforts to reach its $130 million Annual Fund goal for The Meliora Challenge: The Campaign for the University of Rochester. To date, members have accounted for nearly $50 million in gifts to the University. The night featured several leadership speakers, including Board Chair Ed Hajim ’58, University Trustee and Annual Giving Programs Chair Gwen Greene ’65, and President Joel Seligman. Members also heard from rising senior Melisa Diaz ’14 who shared how she came to choose Rochester, how she has spent her time here, and how she hopes to “pay it forward” as others have done for her. As part of her remarks, Diaz proudly noted her participation in Strong Jugglers. Her ability to juggle fire torches, knives, balls, and other items became a part of keynote speaker Walter Isaacson’s address, which was focused on creativity. Isaacson is a world-renowned writer and biographer and the author of Steve Jobs. Members learned about a new focus for the George Eastman Circle: named scholarships. Through a new program, members will have the opportunity to have an immediate impact on Rochester students by supporting current-use, named scholarships at a school of their choice. To read more about George Eastman Circle scholarships, clickhere. To view a photo gallery from the dinner, click here. It was wonderful to see so many of our members last week at The Plaza for our sixth annual New York City Dinner. In addition to enjoying dinner and an enlightening keynote address delivered by Walter Isaacson, many of our members participated in meetings for the Campaign, our Board and National Councils, and the George Eastman Circle. For a variety of reasons, I know many of you are not able to attend the events we hold in New York, which includes our dinner in the metro area. We are continually adding to our list of events across the country to provide more opportunities to network with other members and engage with the University. Included in this newsletter is a current listing of some of those upcoming events, as of this publication. As always, our ever-expanding membership has given us much to celebrate. Whether you have just joined us—or if you’ve been a member for years and recently renewed your commitment—you’ve likely heard that the George Eastman Circle now has 2,536 members. In the coming weeks, you will read about our increasing influence and commitment in the annual edition of the George Eastman Circle Honor Roll, which recognizes our active members who have made five-year pledges to the University. Also within the Honor Roll—which will also be available online this year—you will find examples of the many ways your gifts have made a remarkable impact on the University of Rochester’s schools and units. I’m so honored to be listed within the pages of this historic document with you. All of our members have wonderful stories to share about their membership. We are pleased to feature one such story from the 2012 George Eastman Circle Honor Roll. 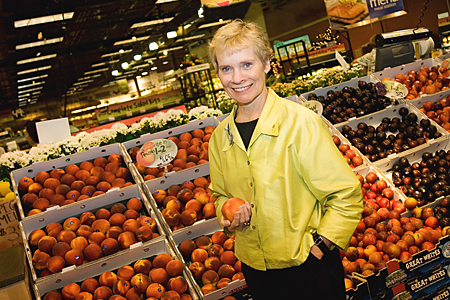 After several years of teaching home economics and working for cooperative extensions, Mary Ellen Burris ’68W (EdM) came to the University of Rochester to learn more about human behavior. What she found exceeded her expectations. Now, as senior vice president for consumer affairs at Wegmans, she regularly draws on the knowledge gained at the Warner School, especially the lessons she learned about persuasion. Understanding people’s natural reaction to change and knowing how to make a transition seem more acceptable to others have been invaluable skills. From encouraging healthy eating among shoppers to influencing corporate decisions, she has put her knowledge of human behavior to use. Her volunteer work on the Warner School Dean’s Advisory Committee and her support of its annual funds is directly related to her fond memories of her time here and her great respect for the School’s leadership. The latest George Eastman Circle Honor Roll is in the mail and is now also online. You will soon receive an email with a link to a private page on the George Eastman Circle Web site where you can access the Honor Roll. We are excited to offer this special membership enhancement and hope you enjoy this year’s edition. If you have questions about the new online version of the Honor Roll, please call Nancy Goldsmith Zawacki at (585) 276-3597. Highland’s Palliative Medicine and Gynecologic Oncology programs earned national recognition from the Joint Commission. As part of its efforts to become a more patient- and family-centered hospital, Highland launched innovative partnerships with patients and families. Pathology Bedside Rounding is an example of these partnerships that has drawn international recognition. Highland opened a new East 7 unit, supporting two important initiatives: the launch of neuromedicine services and the expansion of the C. McCollister Evarts, M.D. Joint Center. Two new, state-of-the-art operating rooms opened to support growth of surgical volumes. Increased financial aid and scholarship support helped Rochester welcome its most global class ever. The Class of 2016 represents 49 states and more than 50 countries. Curriculum enhancements were made in East Asian Studies and in African and African American Studies. Additional innovative programming was designed to broaden global interaction. Faculty was strengthened through the hiring of more than a dozen new colleagues with expertise in areas such as political science, biology, philosophy, anthropology, economics, religion, earth and environmental sciences, psychology, and studio arts. The School hosted The Prismatic Debussy Festival, a month-long celebration of the 150th anniversary of the birth of composer Claude Debussy. More than 80,000 patrons attended remarkable performances in Kodak and Kilbourn Halls and Hatch Recital Hall this past year. The Eastman Chamber Jazz Orchestra presented six concerts at the Umbria Jazz Festival in Perugia, Italy—one of Europe’s most prestigious jazz festivals. Programming featured the music of Gil Evans, an innovative composer, arranger, and bandleader who is best known for his collaborations with the legendary Miles Davis. Eastman hosted several hundred acclaimed violists from around the world for the 40th International Viola Congress. The event welcomed current and former orchestra principals, prominent soloists and chamber musicians, educators, and “rising star” students. Charles A. Thornton ’91 (Flw) was installed as the inauguralSaunders Family Distinguished Professor in Neuromuscular Research on February 7 in recognition of his outstanding research in neuromuscular disease. 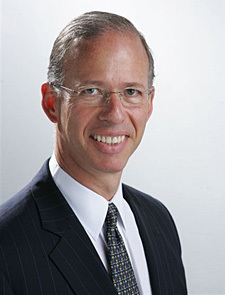 Thornton’s position was created as part of a $10 million gift to the University of Rochester Medical Center from E. Philip Saunders, honorary chair of the George Eastman Circle Rochester Leadership Council. To read more about Dr. Thornton’s installation, click here. Jay S. Benet ’76S (MBA) and his wife Jeanne have committed $1.5 million to establish the Jay S. and Jeanne P. Benet Professorship of Finance at the William E. Simon School of Business. Jay Benet is a George Eastman Circle Charter Member. To read more about the Benets’ gift, clickhere. Associate Professor of Political Science and Business Administration David Primo, Ph.D., was installed as the inaugural Ani and Mark Gabrellian Professor. The professorship was established with a $1.5 million gift from University Trustee Ani Gabrellian ’84 and her husband Mark Gabrellian ’79, who are Charter Members of the George Eastman Circle. To read more about Professor Primo’s installation, click here. Raymond F. LeChase Hall opened its doors to students and faculty for the spring semester in January of this year. The building’s name honors the father of University Trustee R. Wayne LeChase who with his wife, Beverly, made a $3.5 commitment that enabled construction to begin in 2011. The LeChases are also Charter Members of the George Eastman Circle. To read more about this gift and LeChase Hall, clickhere. One of the more striking features of LeChase Hall is the Wentworth Atrium, named to commemorate a $1 million gift from Robin Wentworth P’11, P’16 and Timothy Wentworth P’11, P’16. The University will celebrate the formal dedication of LeChase Hall in May. To read more about this gift, click here. Construction continues on Ronald Rettner Hall for Media Arts and Innovation, which is expected to open in fall of 2013. The building was named in honor of the leadership gift made byUniversity Trustee Ronald Rettner. To read more about this gift and Rettner Hall, click here.